A look back at 80s clothes, hair styles and fashion fads. Plus, advice on creating 80s fancy dress/party costumes and T-shirt ideas. Mork actually made his first appearance on the fifth series of Happy Days (another series I used to watch in my 70s childhood) where Richie Cunnigham had a dream about being the alien trying to take him back to Ork. Anyway, as this post is supposed to be about T-shirts, let me now discuss them! 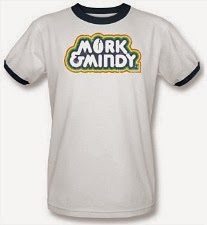 By far, the best-looking tee is the one above which features an authentic print of the original Mork & Mindy logo. The tee is available at redbubble.com for men and women, and in a range of colours. It's aalso available as a sweatshirt or hoodie. Redbubble ship worldwide, too. 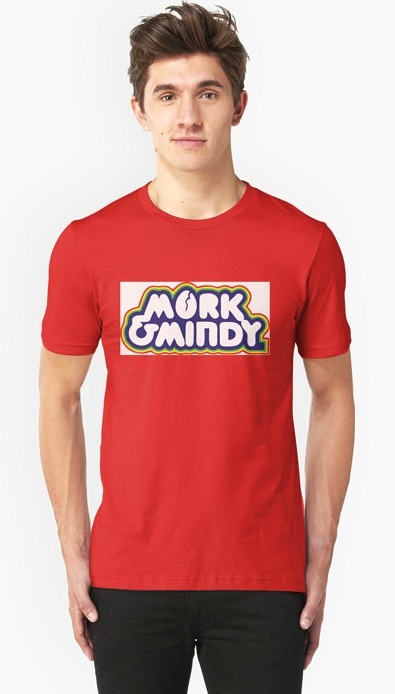 See More Mork & Mindy T-shirts at Redbubble. The best design award has to go this the official T-shirt which has a retro style ringer design. Ringer T-shirts were very popular in the 70s, which makes this one look like it's been plucked from a time capsule. Unfortunately, this particular tee is very hard to find in the UK, and I believe the only British supplier selling it is Fashion First on the Amazon website. Therefore, it's not cheap at £24.65 to £29.40 plus £8 delivery, but if you want to be amongst a minority of British people wearing this design then you may feel it's worth the asking price. It would certainly look fantastic at an 80s event/party. There are, of course, many other T-shirt designs available, but the items I've featured are certainly the most stylish and the only ones to feature the original logo. See all Mork & Mindy T-shirts at Amazon.co.uk. 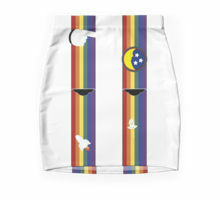 An interesting item I found at redbubble.com was this mini skirt which is available in sizes from XXS to XXL. Add it to your T-shirt and you have an instant costume! 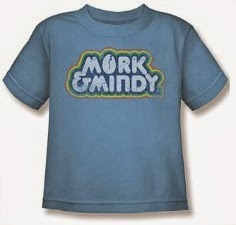 You can read my review of the Mork & Mindy TV series at my website simplyeighties.com. So, who's old enough to remember the original Bill and Ben series? Simply titled The Flowerpot Men, the children's TV series first aired way back in 1952 as part of Watch With Mother on BBC1. It was repeated throughout the 1960s and 70s, and I certainly remember watching it back in the early 1970s when I was a wee lad. The duo lived behind a potting shed in the garden and talked in oddle poddle (sounds like my neighbour!) and were friends with Little Weed. A new series was created in the Noughties, bringing the duo to a whole new audience. If you're going to a fancy dress party with a friend or partner and you've been stuck for an idea, then I suspect that these two guys never even entered your head! So, if you're looking for an original idea then this could be your answer. These bright and colourful costumes would look great at any party, but especially one with a retro or TV theme, and they would also be highly appreciated at a kids party, too. 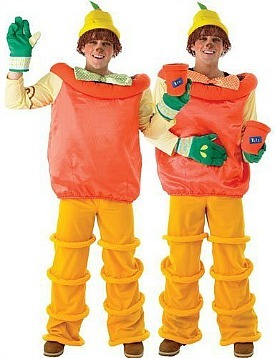 The outfits could also be used at a gardening event or to promote a garden centre. There are, no doubt, countless other uses for the costumes. The costume above includes a top, orange trousers, yellow pot hat with yarn hair, bow tie, gardening style gloves and double sided flower pot which is actually a drink holder. You may also want Little Weed to accompany Bill and Ben to the event/party. This cute-looking costume includes a dress, leggings and headpiece, and would also be ideal on its own at a gardening-themed event. If you're looking for 70s and 80s Fancy Dress then be sure to check out my website Simplyeighties.com for lots of ideas.